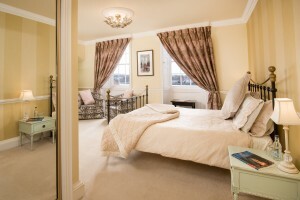 The Tweed Room is a popular room with our guests and is located on the 1st floor. 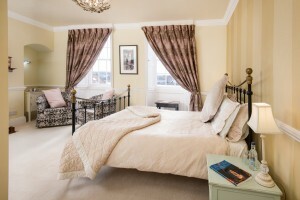 Like the Swan Room, it commands great views across the River Tweed from it’s two large Georgian Windows. 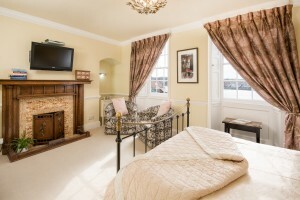 The Tweed Room consists of a king-sized decorative metal bed, two comfy bucket chairs and a large wall mounted smart TV with a full Sky TV package and Netflix. A separate door leads into a modern en-suite bathroom consisting of a walk-in shower, basin and toilet. The room includes a large double mirrored wardrobe for storage. The room is large enough to be able to add a cot or fold-up bed for a small child.